CASTLE FRONT This model is circa 1933. The castings are nickel plated and then hand painted with a blue background. The shield is highlighted in red and yellow. 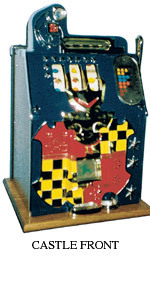 The machine automatically pays all left to right winning combinations with 2 coins being the smallest amount for one cherry. The highest pay is the jackpot paying 20 coins from the coin tube and whatever amount is in the jackpot (behind the window in the lower center of the machine). The machine is remanufactured by skilled technicians. It is made by MILLS BELL-O-MATIC in the Royal Bell, Ltd facility in Denver. The machine weighs approximately 100 pounds.